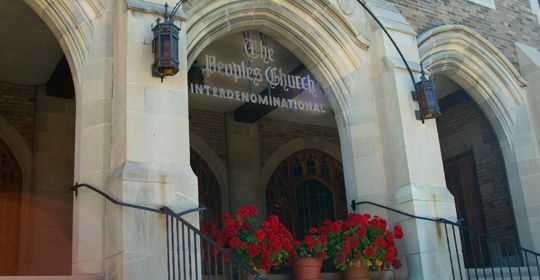 The Church I go to (The People’s Church) is an interdenominational Church. Over 100 years ago, four religions came together to create this experiment in religion. A place of worship that would welcome everyone. Regardless of religious background. If you wished to worship God, learn the words of Christ, explore Christianity, you are welcome here. This is what drew me to this Church in the first place. Presently we have only one Minister, and she is on vacation this week. Today I was unsure what to expect when I went to service, but was pleasantly surprised. Today was Youth Sunday and the entire service was presented by our Youth Group, run by Betsy Aho. These teens are amazing individuals. I commented to another member as we enjoyed service, that I’d never been in a Church that had such tremendous involvement from the youth of the congregation. Today’s scripture lesson was Matthew 5:1-12 .. aka The Beatitudes. 11 “Blessed are you when people insult you, persecute you and falsely say all kinds of evil against you because of me. 12Rejoice and be glad, because great is your reward in heaven, for in the same way they persecuted the prophets who were before you. The sermon, presented by another of the teens, was entitled “Listening”. She talked about the surprise at what the beatitudes means. How should it be that the meek will inherit the earth? How should it be that the poor in spirit will inherit the Kingdom of Heaven? And she went on to talk about how she sees God’s life in her world. One simply has to LISTEN for God, and keep eyes and heart and mind open to the spirit of God. Then they went on to show a pictorial presentation, showing the Beatitudes in action. It was surprising and quite beautiful. These kids are the future of not only our Church, but of our world, and to know that they are being raised with these fantastic lessons that were written so long ago, that we still hear and see today… it’s inspiring and gives me hope for the future of our world. We can truly learn a great deal from the younger generations. While our elders have the wisdom of many years, the parents of these teens have the ongoing education that they get from their kids, those kids are learning to see things in a way that differs from what might be considered the ‘normal’ way for those who have become set in our ways. Embrace our youth, show them love, compassion and kindness, teach them in ways that will strengthen their morals, their character and give them a strong foundation on which to build their own lives, and the lives of those who share this world with them. I am blessed to be a part of this Church, and I am thankful to God for guiding my steps into the doors of this beautiful building so I may get to know these amazing people. The elderly members who have been with the Church a very long time, my peer group who have been in the Church far less time, and of course our Teens who seem to find ways to teach me something new.